I recently read an article in the Harvard Business Journal that pretty much summed it up. In essence it asserted that Strategic Planning is something only smart people do. This is a myth! The problem with this myth is that it assumes that Strategic Planning is reserved for an elite group of people who are either born with a 6th sense of the future or have honed a scholastic storehouse of skills and knowledge to develop ethereal plans for the future. Allow me to turn off the smoke machine and drop the mirrors for a moment. Strategy is for everyone… you and me as well as Joe and Sue down the street. In simple terms, the Strategic Planning and Foresight process helps an organization to hypothetically stand in the future so that they can be more competitive today. This process focuses the organization on a path toward a preferred future of profitability and considers potential disrupters along the way. Strategic Planning is typically focused on the here and now with an event horizon or future date within 5 years of today. We best know them as the three to five year plan. The three to five year plan is a great template to help us navigate the immediate future. Unfortunately many companies will spend hundreds of hours crafting their three to five year strategic plan, only to put it in a binder on their shelf and let it sit there until the next strategy meeting. Strategic Planning is not about developing a beautiful set of documents insomuch as it is a plan that the company should and must interact with on a daily basis. The plan should be tied to the organizations goals, mission and first principles and referred to daily. Once we have mastered the strategic plan, we must consider the world beyond the typical strategy plan. In this case we move into a process called Strategic Foresight. Strategic Foresight is a deliberate process of establishing well-informed future oriented perspectives that help guide innovation, planning, and decision-making at a macro-level. The process of Foresight creates competitive advantage by providing a future context for strategy and plans. In other words, a proper foresight plan will bring meaning to the current three to five year strategic plan we refer to on a daily basis. Creating a future context provides us with a level of uncertainty that extends the organizations beyond known risks. While most business leaders are well-accustomed to three to five year strategic plans, Strategic Foresight uses a time horizon of ten to twenty-five years (or more) to look for trends and game-changers which will shape the organizations future. The process of foresight generates insights about alternatives which could affect the organizations future. Foresight assists the organization in developing problem-solving skills which address potential mission-critical challenges. Developing a Foresight plan is worthwhile for any organization. If you believe your organization would benefit from a comprehensive strategic plan, we are ready to help! Our team has over 60 years of leadership, management and organizational development experience. If you believe your organization could benefit from our 4-step process, please contact us today for a FREE consult. No one knows your business better than you, right? This is a trick question because, while you and your team know your business, if your methodology is flawed then the way you do business is broken. This is why the organizational analysis in STEP 1 becomes so important. Case in point: I recently spoke to an organization that requested I conduct a survey of their customers to reveal a predetermined outcome. While it is always a good idea to get feedback from customers in STEP 1, it is only part of the equation. It is liken to changing the oil in your car in hopes it will fix the broken radiator. If you don’t look at the whole picture and address the actual problems that exist, your organization will flounder and perhaps fail. STEP 2 becomes a painful outcome of a failing organization because change is not easy on any day. Add to this a heightened level of dysfunction and you’re in for a treat. STEP 2 is about changing beliefs and broken actions. As I’ve written previously, change takes time and the process of change cannot be rushed. Once your organization has moved through the first two steps of the Organizational Success Model, you are now ready for STEP 3: Process Improvement. As a result of the analysis and alignment process, the organization’s best practices and deficits are now clearly exposed. We are then able to begin considering the “How” of what organizations do and develop scalable processes and best practices to generate positive outcomes. The key to this step rests in the idea of scalable. Scalable is when a process can grow and contract with the organizations life cycle. Unfortunately many organizations are still using systems and processes that are out of date and have not kept up with the organizations growth, changes in laws or even technology. Process Improvement requires someone with an unbiased view of the organization to observe and report those areas that appear to be in deficit. Process Improvement also requires speaking with the individuals in the company who actually do the work and asking them questions like, “what would you do to improve this process” or “what would you change in this process to create efficiencies?” Unfortunately what I’ve discovered is that many leaders believe they know better than their followers on how things are done. The key to success in STEP 3 is locked in the engagement of the followers. When you include them in the change process, they are more apt and able to assimilate the changes required to achieve success. Effective leadership is really in the empowerment of your followers to do their job. It means getting out of their way and letting them do what they do best. If you believe your organization would benefit from an honest assessment of your operations, we are ready to help! Our team has over 60 years of leadership, management and organizational development experience. 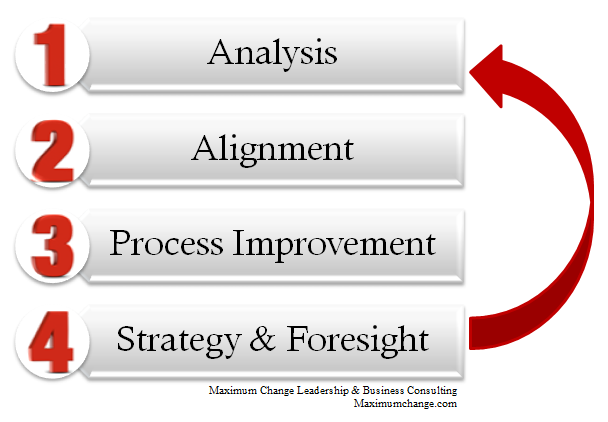 If you believe your organization could benefit from our 4-step process, please contact us today for a FREE consult.